Catherine of Aragon Biography Facts: She is famous for being the first wife of Henry VIII, she was also the wife who was married to him for the longest, leaving the marriage with her head still attached to her shoulders. Catherine was the daughter of King Ferdinand and Queen Isabella of Spain and the union between the princess and Henry was viewed as a way of sustaining peace between the two countries. This was not, however, Catherine’s first marriage, she had previously been married to Henry’s elder brother Arthur, the Prince of Wales. His untimely death, just months into their marriage left her alone and hopeful that Henry would take her for his bride. Catherine of Aragon Biography, She was born in Spain on 15th December 1485. Brought up with strong Catholic views she became wife first to Arthur, Prince of Wales in November 1501 at only sixteen years of age. Six months later she became a widow and in 1509 was married to Arthur’s brother Henry. Though their marriage was annulled in 1533 Catherine always refused to accept their divorce. Neither did she accept that Anne Boleyn was Henry’s new queen. Catherine was crowned alongside her king in a lavish ceremony. In these early years of their marriage, it was clear to see that there was a strong bond of love between them. But, after several failed pregnancies and the death of several children only their daughter Mary survived into adulthood. The loss of so many children took its toll on Catherine, and Henry too began to believe that his marriage had been cursed by God. Desperate for an heir to the throne which he realized Catherine was never going to give him, he sought a divorce. The pope was unwilling to give Henry what he so desperately wanted, so Henry had to find another way out of his now unhappy marriage. Mary, the daughter of Catherine and Henry did not have an easy childhood. She was brought up in the Catholic faith like her mother, and when Henry declared himself the Head of the Church of England and the process of reformation swept through the country, both Catherine and her daughter refused to accept the new religion. Mary was declared illegitimate by her father, which meant that she would be unable to take the throne upon his death. 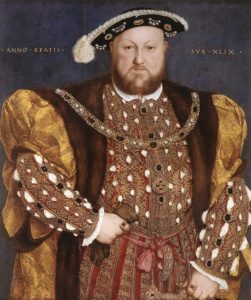 Henry was convinced that England would not accept a female monarch. Catherine died in her home, Kimbolton Castle on 7th January 1536. the castle had been her home for a number of years, although for the last few months of her life she was practically a prisoner in her quarters. She was reportedly locked inside her rooms, attended only by a few trusted servants. There were rumors that she had been poisoned. The blame for which was directed towards the Royal Court. It is recorded that the embalmer that prepared her body for burial stated that her heart was “quite black and hideous to look at”, which would indeed suggest foul play.